Corrosion is the deterioration a material undergoes as a result of its interaction with its surroundings. Although this definition is applicable to any type of material, it is usually reserved for metallic alloys . Of the 105 known chemical elements, approximately eighty are metals , and about half of these can be alloyed with other metals, giving rise to more than 40,000 different alloys. Each of the alloys will have different physical, chemical, and mechanical properties, but all of them can corrode to some extent, and in different ways. Corrosion is a natural phenomenon. When newly made steel is first exposed to the air, its originally shiny surface will be covered with rust in a few hours. The tendency of metals to corrode is related to the low stability of the metallic state. Metals occur either in the pure metallic state, the zero oxidation state, or in the form of compounds with other elements (they acquire positive states of oxidation). In the natural world, most metals are found as compounds with other elements, indicating the greater stability of their oxidized forms. For this reason, to obtain the pure metal from one of its compounds, it is necessary to put in energy. The reverse is true when a metal is exposed to its environment: it tends to release this stored energy through the processes of corrosion. This is rather analogous to what happens when an object is suspended at a point above the ground (equivalent to the metallic state). When allowed to fall or reach a stable state, it returns to a position of minimum energy on the ground (equivalent to the metal's oxidized state). The chemical reactions that take place in corrosion processes are reduction-oxidation (redox) reactions. Such reactions require a species of material that is oxidized (the metal), and another that is reduced (the oxidizing agent). Thus the complete reaction can be divided into two partial reactions: one, oxidation; the other, reduction. In oxidation, the metal loses electrons. The zone in which this happens is known as the anode. In the reduction reaction, the oxidizing agent gains the electrons that have been shed by the metal, and the zone in which this happens is the cathode. Corrosion processes not only influence the chemical properties of a metal but also generate changes in its physical properties and its mechanical behavior. This is why the effects of corrosion are manifested in a variety of forms. The most common form is uniform corrosion, whereby there is a generalized, overall "attack" of the entire exposed surface of the metal, leading to a more or less uniform reduction in the thickness of the affected metal. In contrast, there is the process of localized corrosion, in which an intense attack takes place only in and around particular zones of the metal, leaving the rest of the metal unaffected; an example is pitting corrosion. Some other forms of corrosion are stress corrosion cracking, galvanic corrosion, selective alloy breakdown, intergranular corrosion, fatigue, friction, erosion, cavitation, hydrogen enbrittlement, biocorrosion, and high temperature oxidation. 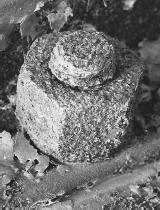 This metal bolt is rusted, a result of the oxidation of the iron metal of which it is composed. It is easy to find everyday objects that show signs of corrosion. A used automobile consists essentially of different metals, plastics, paints, metallic coatings, and so forth, which have been exposed to a variety of aggressive conditions. These materials are exposed to the action of atmospheric agents under conditions of high temperature, are incorporated in closed water circuits, or are subject to mechanical wear. As a result, we see many signs of corrosion in cars, chiefly on the bodywork and in the exhaust system, and especially after years of use. Traffic signs, streetlamp standards, metal barriers and fences, and many other items seen along roads are usually manufactured in galvanized steel (normal mild steel with a zinc coating). On such items it is common to see "white" corrosion (zinc oxide), characteristic of the oxidation of a zinc coating, often with spots of red rust also appearing that indicate that the steel base is being corroded. The sea and the salty atmosphere are saline media that are highly aggressive to metals. Marine structures such as ships, bridges, and drilling rigs and platforms usually show signs of severe corrosion unless they have been properly protected. Cars kept near oceans show signs of corrosion. Alloys of copper used in the casting of sculptures, and used externally on some buildings, usually show a greenish coloring that corresponds to a layer of corrosion product known as copper patina that gives some protection against further corrosion. The degradation of reinforced concrete in buildings is commonly caused by the corrosion of the steel reinforcing bars within the concrete, rather than by the loss of the mechanical properties of concrete. Corrosion processes affect many areas of human activity in which metal products are used. In general, as levels of economic development increase, so do costs incurred as a result of corrosion. It is estimated that the costs attributable to the corrosion of metallic materials amount to 4 percent of the gross domestic product of the developed countries. And this cost, representing a loss of resources, would be even higher if methods of protection against corrosion were not so widely applied. It is estimated that because of this protection, populations are able to reduce these potential losses by a factor of about 30 percent. Many methods for preventing or reducing corrosion exist, most of them orientated in one way or another toward slowing rates of corrosion. A series of methods that are based on depositing a layer of a second material on the surface of a metal structure to impede the structure's contact with an aggressive medium have been developed. The most prevalent of these is painting, and a wide range of protective paints is now available. As a general estimate, for every 100 m 2 of exposed metal surface, paint is applied to 90 m 2 . Included among these surface covering methods are metallic surface treatments, such as chrome, nickel, and galvanized coatings, and inorganic treatments, such as chromates, anodizing coatings, and phosphate coatings. Another method of protection uses inhibitors, which are substances added to the liquid medium, again to reduce rates of corrosion. Antifreeze liquids utilized in the cooling circuits of vehicle engines have inhibitor agents incorporated into their formulations in order to reduce corrosion problems. Cathodic protection is an anticorrosion technique widely used in ships and in buried or submerged pipe work. This method seeks to reduce the rate of corrosion of the structure to be protected by joining it to "sacrificial" anodes. In other words, the structure is joined to another metal (an anode) that corrodes more readily, effectively diverting the tendency to corrode away from the structure. As an alternative to using metals that must be protected by one or other of the methods described, engineers often have an option to use an alloy selected for having a greater resistance to corrosion caused by its surroundings. But better corrosion resistance usually comes at a higher materials and/or manufacturing cost. Engineers must take into account that the corrosion resistance of any alloy depends on both the medium and the working conditions. Hence, alloys with good resistance in one environment may have poor resistance in another, and their resistance is also likely to vary according to differences in exposure conditions, such as temperature or stress. Bradford, Samuel A. (1993). Corrosion Control. New York: Van Nostrand Reinhold. Fontana, Mars Guy (1986). Corrosion Engineering , 3rd edition. New York: McGraw-Hill. Jones, Denny A. (1996). Principles and Prevention of Corrosion , 2nd edition. Upper Saddle River, NJ: Prentice Hall. Roberge, Pierre R. (2000). Handbook of Corrosion Engineering. New York: McGraw-Hill. Shreir, L. L.; Jarman, R. A.; and Burstein, G. T., eds. (1994). Corrosion. Boston: Butterworth-Heinemann. Information available from: http://www.corrosion-doctors.org . thank you for this information it was very very useful to me. Thanks for this information. It is the most important with me.